3) A stone from the 60mm sphere page. 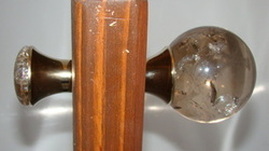 of the finished products are shown at right & below. Crystal Quartz, oil-rubbed bronze finish on a closet door. 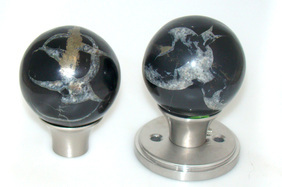 60mm Pull Knob backed to 40mm Disk Base Knob* - set screw holding them together. 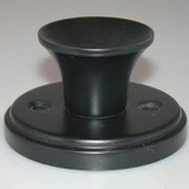 Pull Knob with Rosette backed to a 40mm Base Knob* on the opposite side. *Must purchase a sphere from the 60mm page so we can attach it to the hardware. Measure door thickness to order appropriate length screw.